The full title of this exceptional book by Marie Read is Mastering Bird Photography: The Art, Craft, and Technique of Photographing Birds and Their Behavior. It is a finely worded encapsulation of both the book’s content and the reason why I feel like I’ve finally found the right bird photography guide, one that teaches basic technical skills, describes diverse, professional ways to approach the ‘capture’ of an avian image, but which also urges birders and photographers to go beyond the classic, closely-cropped bird photo and use photography to create a mood, paint a place, tell a story about how birds live and why we observe them. I first became familiar with the photographs and photo essays of Marie Read through their publication in Living Bird, the Cornell Lab of Ornithology magazine (British-born, Marie lives in the Finger Lakes area). She has also written the excellent Into the Nest: Intimate Views of the Courting, Parenting, and Family Lives of Familiar Birds (coauthored with Laura Erickson, 2015), Sierra Wings: Birds of the Mono Lake Basin (2014), Secret Lives of Common Birds: Enjoying Bird Behavior Through the Seasons (2005), and Common Birds & Their Songs (coauthored with Lang Elliott, 1998). Her photos have appeared in numerous magazines, educational exhibits, calendars, and she has won prestigious photography awards. But, more importantly, at least from my perspective, Read has the soul of a storyteller and the mind of an educator. She captures avian behavior and habitat in painterly palettes that are rich yet subdued, in compositions that are surprising yet familiar, and is adept at communicating the thoughts and process behind the images. In this new book, she puts everything she has learned in over 30 years of wildlife photography down in writing. Read’s perspective is defined from the very beginning, where she quotes a photography speaker she heard when starting out: “Be there, be prepared, be aware, and be lucky.” This is deceptively simple advice, she points out, but it also sets the stage for an approach that values technical skill but prizes observation, planning, fieldcraft, and creativity. The first half of the book (there are sixteen chapters) covers technical topics–equipment essentials, focusing and image sharpness, light, exposure, and composition. Interestingly, “Getting Close,” a fieldcraft topic, is wedged in the middle there, after image sharpness and before light, emphasizing the importance of strategy, preparation, and awareness in the midst of thinking about ISO and exposure. I found that there were surprises in each chapter. “Getting Close,” for example, contains a lot of material on the use of bird blinds—not the large blinds sometimes (but not often enough) found in nature preserves, but blinds you buy and construct by yourself. As a birder who photographs, rather than a bird photographer, this never occurred to me before and I find the idea intriguing. A later chapter on creating backyard photographic opportunities, “Beauty Close to Home,” includes material on photographing hummingbirds that will be useful at any hummingbird feeder. The chapter on “Capturing Bird Behavior” (my favorite) gives detailed examples of behavior cues and sound cues to look and listen for in anticipation of interesting preening, courtship, and family behavior. 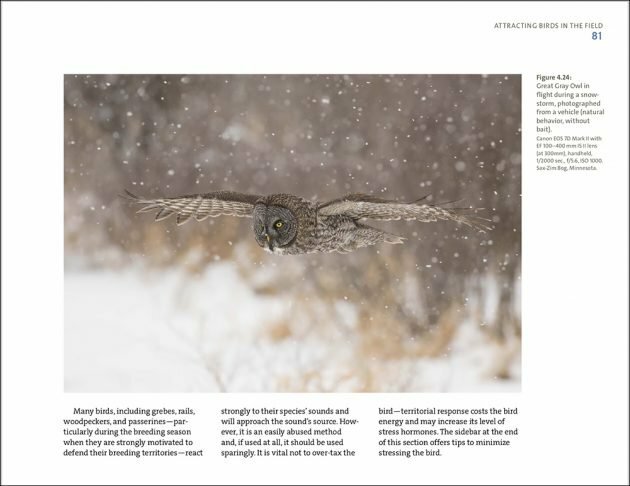 The emphasis of the later chapters of the book is on strategies and fieldcraft for photographing birds’ lives–how they behave, how they fly (“On the Wing), and the habitat and environments in which they live (“The Big Picture” and “Weather, Water, and Mood”). This doesn’t mean that Read doesn’t talk about camera settings and exposure and metering and f-stops and lighting equipment. Each illustration (and, there are many) is captioned with equipment used and camera settings. Also, settings information is fully integrated into the later chapters. The section on shooting birds in snow, for example, covers how to expose for snow (to the right), the consequences of different shutter speeds (fast shutter speed to show individual snowflakes or slow shutter speed to show streaks? ), and how to deal with autofocusing problems (autofocus programming does not like snow’s movement or lack of contrast). Many chapters include boxes that summarize technical camera info, as in the selection from the chapter on capturing flight images below. I do think you will get more out of this book if you open it already knowing how to work your camera (at least the basics) or prepared to spend time exploring its settings as you read. And, it should be noted that sections on settings are written specifically for Canon and Nikon camera users (Read is a Canon photographer), with some mentions of Sony’s mirrorless cameras. Which isn’t to say that you should not buy this book is you’re, say, an Olympus user. Composition is composition, suggestions for photographing birds from a car or a boat or in fog apply no matter what camera you are using. You will need to know enough about your Olympus or Sony or other brand of camera to know how to translate the settings info into your camera’s vocabulary. Though there is no chapter on bird photography and ethics, Read talks about this very controversial topic in two chapters: “Getting Close,” where she discusses playback and owl baiting, and “Capturing Bird Behavior,” where she illustrates how a complicated method of ethically photographing nesting birds (involving a dummy camera and a remote shutter release) and bullet points suggestions, warnings, and cautions on the use of flash, playback, and close presence. Read doesn’t just say ‘do this’ and ‘don’t do that,’ she describes both sides of ethical controversies (such as use of flash) and why it’s better to err on the side of caution. 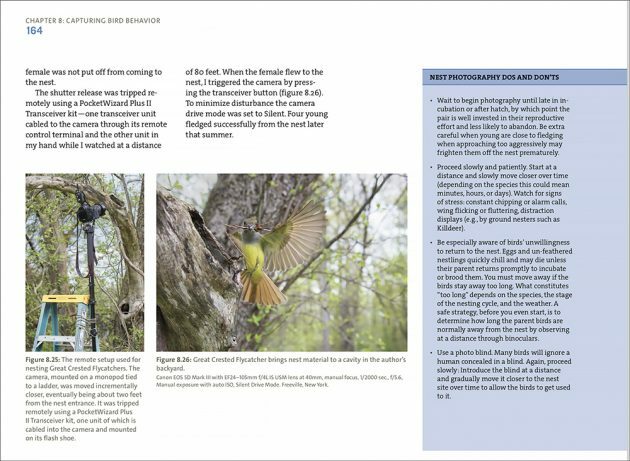 I particularly love this statement, which should be included in every social media bird photography site: “Professionals strive for shots that show natural behavior, not images of alarmed birds that are obviously uncomfortable with your presence.” (p. 165). And, this is where I need to tell you that last January I read and critiqued a draft form of “Getting Close” at Read’s request. This is a topic we had discussed before (and I don’t even remember how that discussion got started), Marie from the photographer’s perspective and me from the birder’s perspective. I knew that reading one chapter would not affect my critical reviewer’s opinion of the book, and Marie knew that too. I was happy to contribute the thoughts of a birder to a project that was still in process. Mastering Bird Photography is a beautiful book. It features hundreds of photographs by Marie Read. Every photo is there for a reason, whether it be to introduce a new chapter (each chapter begins with a photograph and the story behind it) or to illustrate a point about technical settings, fieldcraft strategy, equipment, or one of Read’s many teaching stories. As noted above, each photograph is captioned with equipment used, camera settings, and location. 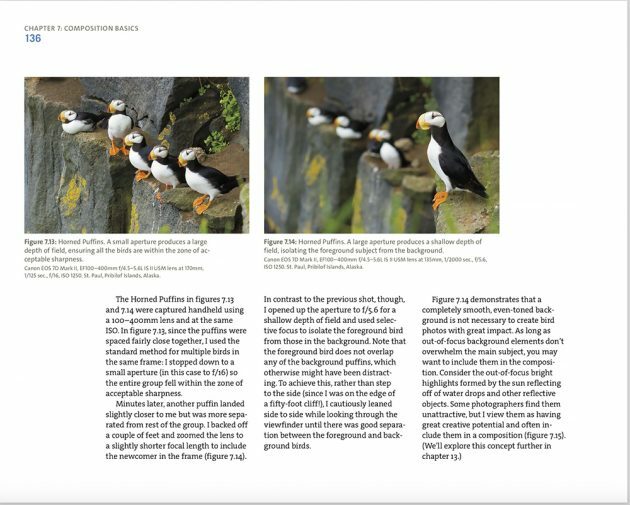 And, not every photograph is perfect; in some cases, Read presents several versions of a specific bird to show how what happens when you use, say, a shallow depth of field, like in the two puffin photos below. There is a lot of information in Mastering Bird Photography, and a lot of different types of information. The book designers (and author, I assume) employ graphic design–including different colored headings, three-column text, and information boxes–to enable the reader to read and take-in all this information at an easy learning pace. Photographs are numbered by chapter and order of appearance and these numbers are integrated into the text, so we always know which image to look at. The photographs are also placed well; images and text are balanced, though it does sometimes feel like there was an urge to go into coffee table territory (and that is understandable, because they are strikingly beautiful images). I was happy to see that the Resources section in the back of the book covers web sites and books on birds, photography techniques and computer tools programs not covered in the book (like Photoshop), and nature photography forums. There are also resources for finding the many different kinds of equipment described in the text and, very nicely, web sites where you can find reviews of photo equipment. The index is divided into two parts–subjects and birds. Mastering Bird Photography is published by Rocky Nook, an independent publishing company that specializes in photography books, and like all their books it is available in digital and paper formats. This review is based on a reading of the eBook format, and I have mixed feelings about it. I like being able to change the size of the text, use the search function, and to copy and paste sentences into my digital notes. I am disappointed that there are no hyperlinks available; for example, you can’t click on a page in the Table of Contents and go directly to that chapter. This may be different in the Kindle version. I like the fact that I can easily carry this book with its invaluable instruction with me wherever I go. I am frustrated by the clumsiness of reading it in bed or on the subway. (Again, most probably different with a Kindle or a smaller laptop.) I will be getting a paperback version of Mastering Bird Photography when it is published at the end of March, and at that point I will be able to report back on quality of paper, binding, and bed-reading-worthiness. The digital versions are far less expensive than the book in paper. And, let’s face it, at $49.95 this is an expensive book. Maybe. There is always the consideration of probable gain in relationship to cost. In other words, if you value this type of bird photography, it is most probably worth it. The amount of knowledge gained from reading Mastering Bird Photography, the resulting improvement in your photographic images, the increase in your enjoyment of the experience–these are your probable gains. And, looking at the question of cost from a different angle, you could say that this is a very cheap professional photography workshop. 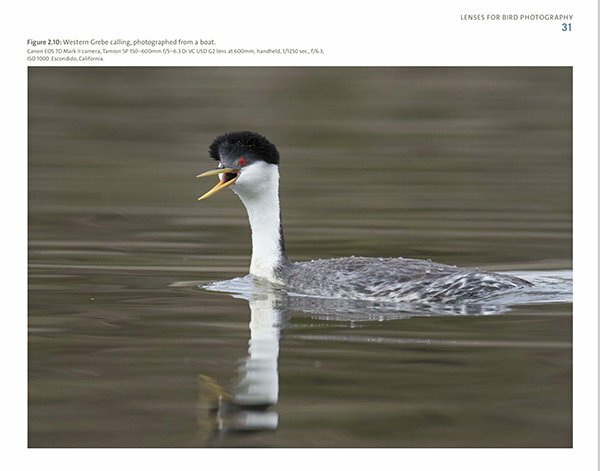 If you are on the fence, I encourage you to read one of Marie Read’s articles, for example, Caught in the Act: How to Photograph Birds in Action, originally published in Living Bird in 2011. Or, and an excerpt from chapter 1, available from the publisher. Mastering Bird Photography offers two basic lessons that are articulated, illustrated, and expanded on throughout: (1) Capturing the endless diversity of bird behavior and habitat is much more satisfying for both photographer and audience than photographing a perched or sitting bird in profile. (2) There are many ways to go beyond the classic bird photograph, to be original and different and create your own kind of beauty. I think this is what makes this book different from other nature photography books. And, it’s understandable that both these goals might seem challenging to the beginning and intermediate bird photographer (I put myself somewhere in-between the two levels, more like advanced beginner). But, Read makes it all seem very possible, utilizing a tone that is friendly and down-to-earth, suggesting rather than telling, using examples of her own learning experiences, offering options, and continuously exhorting the reader to experiment. The last two chapters point us to the future. 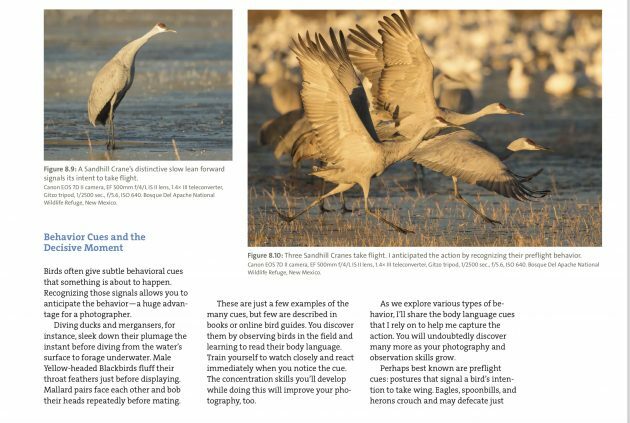 “Bird Photography Hotspots,” presents ten U.S. photography hotspots (also birding hotspots) where the reader can put the book’s lessons into action; they include Bolsa Chica, California (above), Bosque Del Apache National Wildlife Refuge, New Mexico, and my personal favorite, Nickerson Beach, Long Island. Read’s descriptions of these spots are based on her own experiences and she doesn’t hold back, noting the attacking Common Terns at Nickerson, for example, and the necessity of getting there early to avoid the hefty parking fee. I am curious why Mono Lake, the subject of her book and a location for some of the book’s most striking photographs, was not included. “What’s Next?” explores options for sharing, exhibiting, and writing about your photographs. Read offers ways of sharing digitally and in paper, tips for successful presentations and for entering photograph contests. The most intriguing suggestions involve giving back–donating photographs to conservation and educational projects, and, even more strategically, bartering access to a preserve in exchange for documenting bird activity. 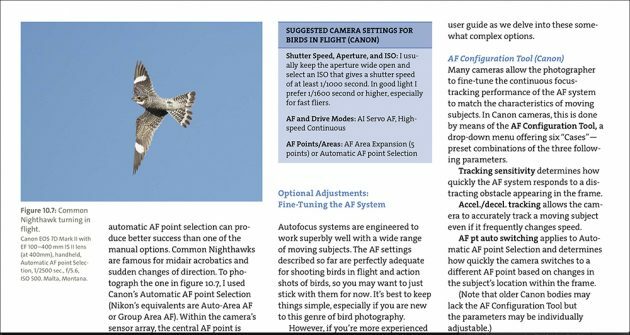 It is suggestions like this that make Mastering Bird Photography a unique and wonderful guide.